While other Asian countries also have photogenic rice terraces, I have never seen one that matches the sheer scale and grandeur of the Banaue Rice Terraces. This is ideal sightseeing period. During the rainy season (summer and fall), low lying clouds can disappointingly mask the slopes. And landslides (especially in July and August) occasionally block roads. 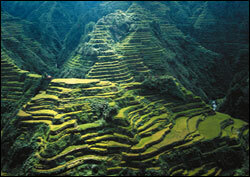 The mountainous rice terraces of Banaue and vicinity in the Philippines are mankind's grandest scaled engineering feat. The vertical distance between bottom and top rows exceeds the height of the world's tallest building. If the terraces were laid end to end, they would stretch more than half way around the world. The Banaue Rice Terraces were carved over a 2,000 year span with primitive handtools by the ancestors of the current farmers, the Ifugao tribesmen. They are facing erosion because of a decline in upkeep. A big reason is some of the young tribespeople are abandoning their family lands to find less arduous jobs elsewhere.